You’re in Barcelona, and you want Christmas. And that warm, toasty feeling of seeing your kids giggle when they get candy from the Catalan Christmas log, the tió de nadal. Or when they squeal when they hand their handwritten letter to the Three Kings. And while we’re officially in December, I’m thrilled that holiday celebrations run until January 6, Three Kings’ Day. So let’s get our Christmas on — and make holiday some memories with our kids, for pete’s sake. 1. Check out the Santa Llúcia Christmas market. 2. See the Carassa de Nadal procession. 3. Beat up a giant Tió de Nadal. 4. Go to the Sagrada Familia Christmas market. 5. 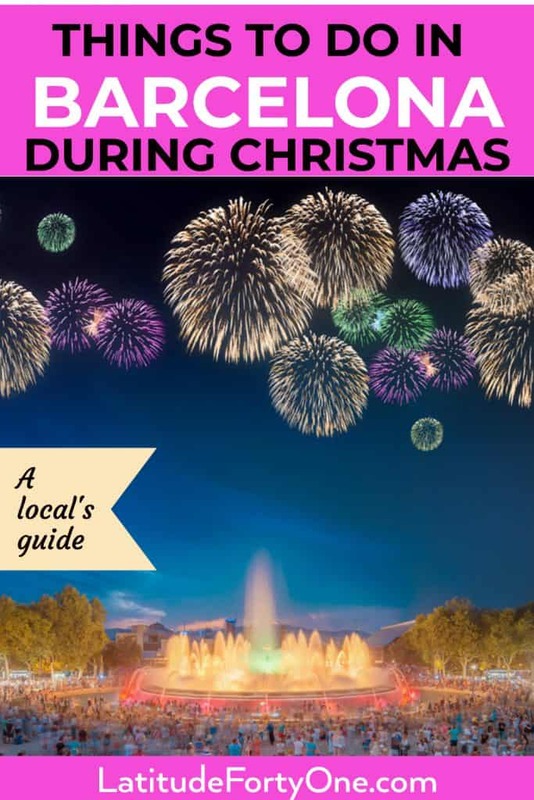 See the Magic Fountain dance to Christmas music. 6. 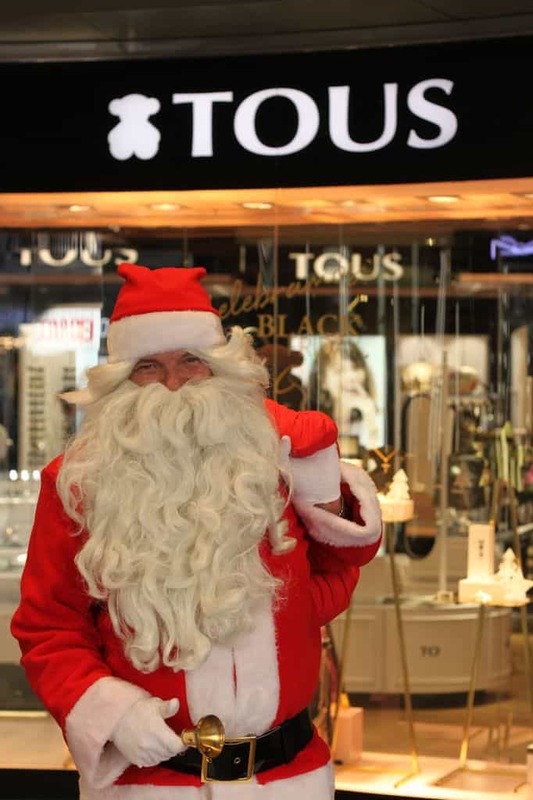 Take a photo with Santa at El Corte Ingles. 7. Check out the Nativity scene in Plaça Sant Jaume. 8. Hit up the multiple events at Plaça Catalunya. 9. Visit the Three Kings Workshop at Fabra i Coats. 10. See a living Nativity scene, join the workshops, or visit Santa or the Three Kings at Poble Espanyol. 11. Celebrate the citywide Barcelona Three Kings’ Parade. The best and largest Christmas market in Barcelona, the Santa Llúcia market is the place to get you drunk on holiday spirit. This year marks the 232nd year! You’ll find rows and rows of holiday-laden stalls in Plaça de La Seu, the plaza of the Barcelona Cathedral. Kids will love looking at the nativity scenes with miniature utensils and chairs, dazzling ball ornaments, and Christmas trees and hand-weaved wreaths. And who can’t not chuckle when we see the caganers and tiós de nadal? Come early – because by 12pm, this place gets crowded on weekends! Santa Llúcia Fair website. Weekdays: 10:30am – 8:30pm. Weekends and holidays: 10:30am – 9:30pm. November 30-December 23, 2018. One of my favorite activities is to check out the Carassa de Nadal procession on the weekends. 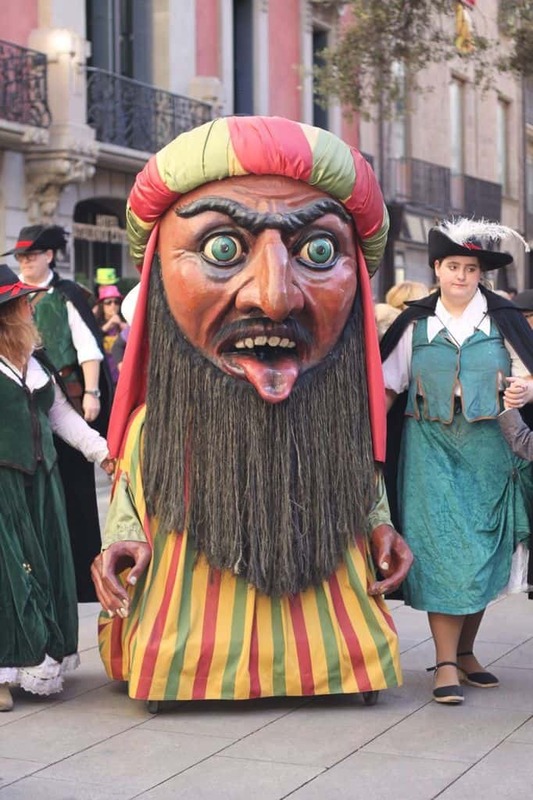 This “big head” on wheels parades around the Santa Llúcia market, followed by a music band and some friends throwing confetti. And watch kids run to the floor when he spits out candy. If you don’t see him around the market, he also glides around the streets in El Gotic district. The website’s not clear where he’ll show up exactly! Confession: I am obsessed with the Carassa. La Carassa de Nadal. 12 noon starting at the Fira de Santa Llúcia on December 1, 2, 15, 16, 22, and 23. 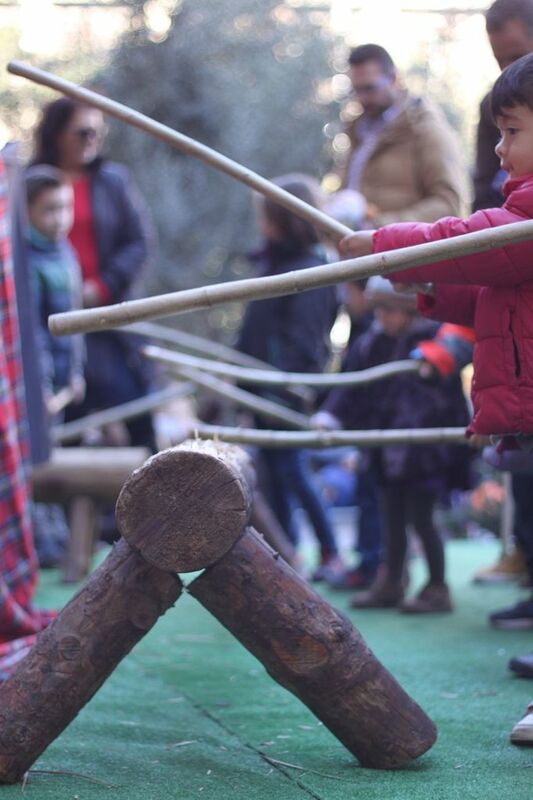 At the Santa Llúcia Fair, kids can beat the huge tió de Nadal, or caga tió. If you don’t know who he is, he’s a traditional Catalan figure — a log perched on two sticks with a happy face on it. And he poops presents for kids on Christmas Eve. 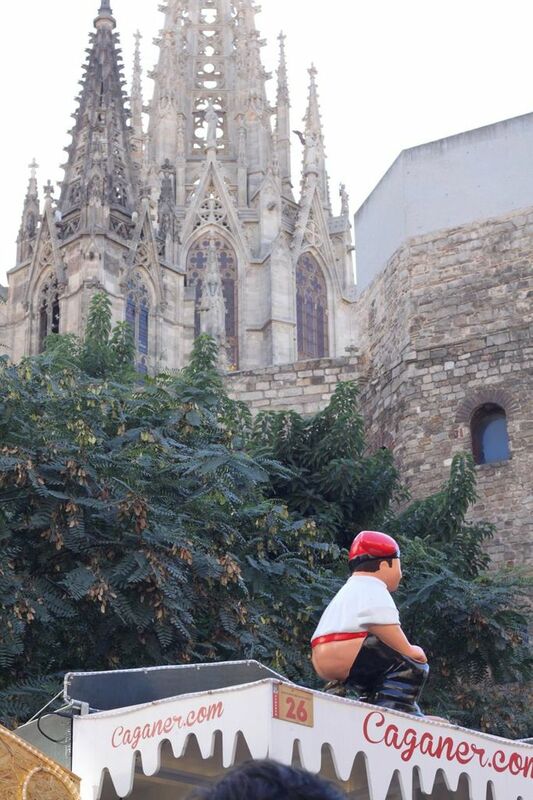 To find the tió gegant, climb the steps that lead up to the Barcelona Cathedral — on Santa Llúcia fair side. You’ll see a line of kids waiting to get their stick so they can “beat” the tió while singing a traditional caga tió song. Here, they beat a piece of wood instead of the log himself (probably to prevent wear and tear on the tió year after year). 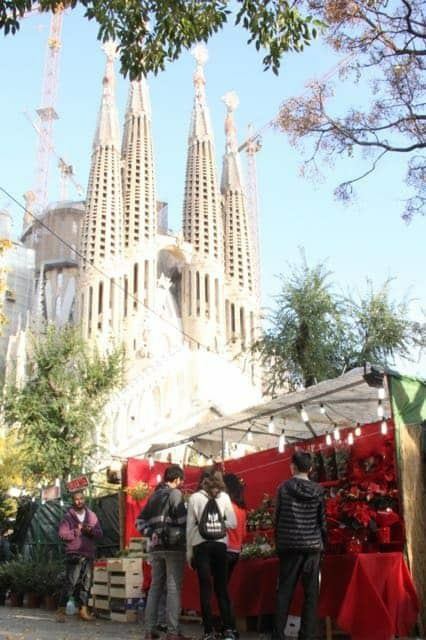 Visit 100 stalls at the Christmas fair at the Sagrada Familia. Not a bad backdrop for your holiday shopping, right? 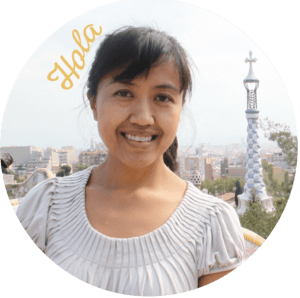 It’s similar to the Santa Lllucia fair, where they sell nativity scenes, Christmas trees and decorations, and handmade gifts like jewelry or warm slippers. Or try warm crepes or sugar-covered nuts. 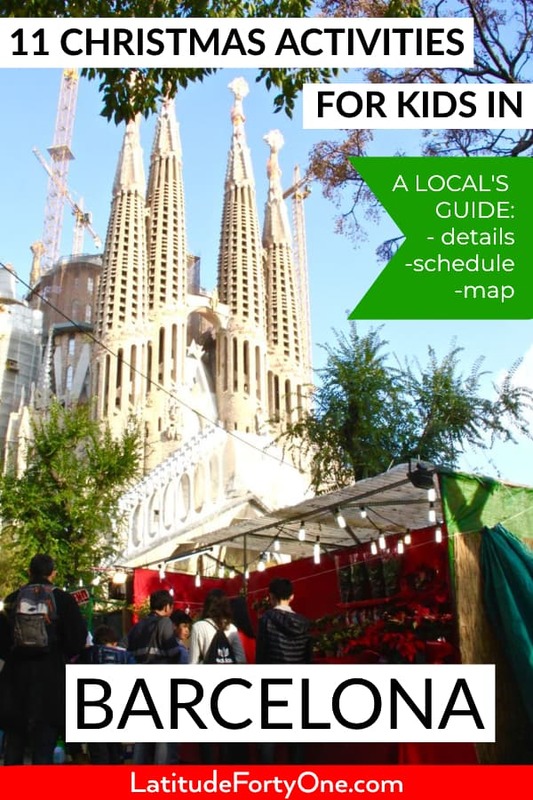 Read more about the Sagrada Familiar market in this post! Official website. November 24 – December 23, Weekdays and holidays 10am – 9pm. Weekends 10am – 10pm. 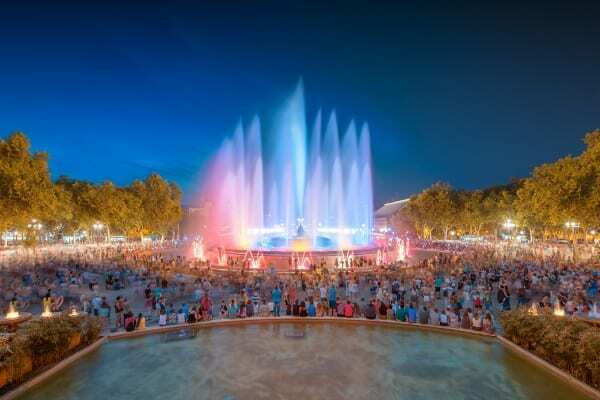 The Magic Fountain at Montjuic is a year-round Barcelona attraction. But this holiday season, you can bet these waters will be dancing their booty to Christmas music. If you want to move into 2019 with a bang, come here to celebrate a special rendition on New Year’s Eve. There’s also a special performance for the Three Kings’ Parade on December 5th. For the full Christmas schedule, visit the Magic Fountain website. At El Corte Ingles, Papa Noel sets up a little house with some helpers. 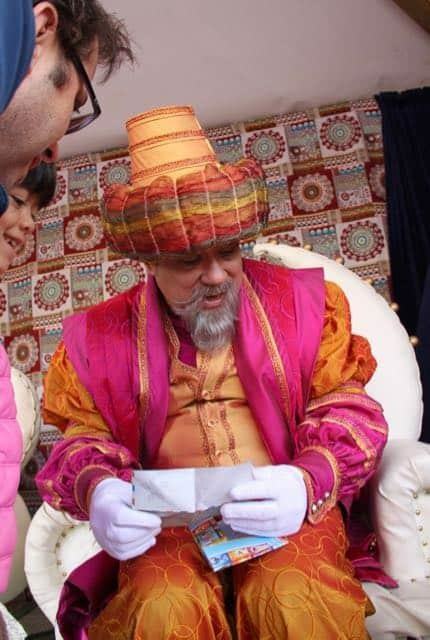 You can drop off a letter and sit on his lap. And you get a free professional photo with him. You just have to come back and pick it up 4-5 days later. Ho ho ho..Feliz Navidad! Bon nadal! UPDATED: As of November 27, there’s no “official” information yet! But for photos, El Corte Ingles Plaça Catalunya, 8th floor. El Corte Ingles, Carrer Diagonal, 5th floor. November 21 – December 24. The schedule varies, so check the website. Every year, a huge Nativity Scene is set up in the Plaça de Sant Jaume by the Barcelona City Council. And every year, they mix up it up from traditional to modern interpretations of the Nativity. This year (2018), the theme is “Tots a la Taula” (“Everyone at the Table”). So, every character in the classic Nativity scene is a figure at the dinner table. I can’t decide if I like it. So judge for yourself. If you want to see a traditional Nativity Scene, go to Frederic Mares Museum, where you can see it at the museum terrace. November 23 – February 2. Tuesday to Saturday, 10am – 7pm. Sundays 11am – 8pm. Mondays CLOSED. Museu Frederic Mares official website here. Plaça Sant Jaume pessebre website. November 23 – January 6. Mr. Winter where he will be performing a show called La Ciutat dels Galets (City of Cookies). Memory Boulevard by the Minimons company, a puppet theatre by Matito Titelles, the bookshop by Marga Socias, the Toy Shop by El Pájaro Carpintero, and a sports activity called the Sports Shop. In an attempt to appeal to teenagers, they’ll have an event called The Rhythm of the Street. Give your wish list to Omar. He’ll take care of ya. We all know that Santa has a workshop in the North Pole. Well, the Three Kings have their factory and warehouse right here at Fabra i Coats. Go inside the Fabra i Coats building, and see the workers prepare the gifts to be delivered on the Twelfth Night. 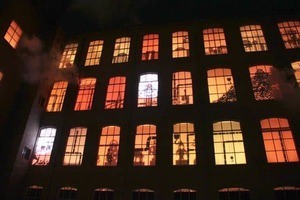 From the outside, three floors will be decorated with colorful lights. And you can see the presents move across a conveyor belt, ready to be shipped and delivered come the Eve of Three Kings’ Day. See your toys being made live. Seriously. So cool. Now someone help me explain. “Mommy, why does my toy say ‘Made in China’?”. Fabra i Coats website. December 27-30, January 2-4. 5pm – 9pm. Last entrance is at 8:40pm. If you’ve never been to Poble Espanyol, you’ll love seeing a small world of the villages of Spain. But for Christmas, they’ve got events throughout the holiday season. December 6-9: Live music, Santa’s grotto, a wishing tree, caga tió, a Christmas market animation, music, and workshops. It also has a living Nativity scene. Real people dress up in character as Joseph, Mary, Jesus, and the usual cast of the three Kings, shepherds, and even goats and donkeys. And it’s all set in a realistic agrarian backdrop, stable and blocks of hay included. Check out the 4-day program details here. Coming later in the month? 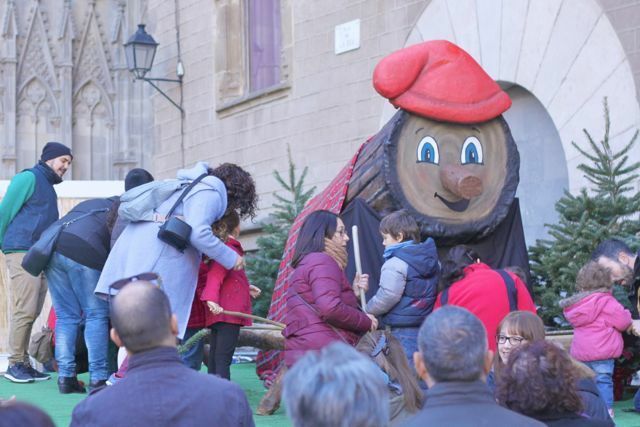 There’s also more Christmas activities in Poble Espanyol December 21 – 29, excluding December 25. Poble Espanyol official website. Free for kids ages 4 and under. At this highly anticipated event, the Three Kings and their entourage will arrive on January 5 at 4:00pm at the Moll de La Fusta. They’ll get on a large, elaborate float and wave to the crowds of excited children. Before them, we’re greeted by hundreds of assistants, magical creatures, and everyday citizens who’ve signed up to join in the festivities. Expect lots of rowdy crowds, hoping paraders will throw candy their way while yelling out the Kings by name. The parade starts at Avenida Marquès de l’Argentera at 6pm. Check out the full route on the website. Three Kings’ Parade. January 5, 6pm – 9pm. Think you’ll be doing any of these activities in Barcelona? 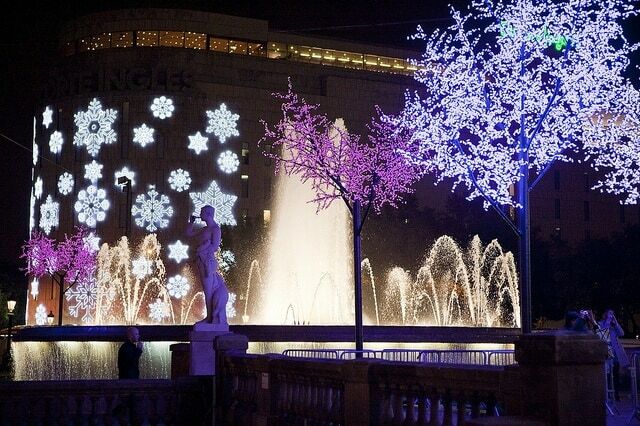 Have you been to Barcelona during Christmas?